There is currently just the 1 ferry route running between Gran Canaria and Lanzarote operated by 3 ferry companies – Fred Olsen Express, Naviera Armas & Trasmediterranea. The Las Palmas to Arrecife ferry crossing operates weekly with a scheduled sailing duration from about 3 hours 45 minutes. Whilst we’ve taken great care to ensure the information on this page is correct, as the frequency and duration of crossings on all routes can vary from time to time we’d advise that you get a live quote for current availability on this Gran Canaria Lanzarote crossing between Las Palmas and Arrecife. 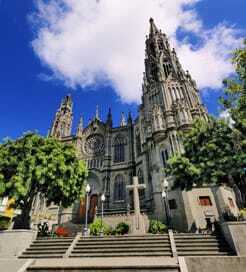 Gran Canaria is part of the Spanish Canary Islands in the Atlantic Ocean, situated off the northwest coast of Africa. Due to the different climates and a variety of landscapes found on Gran Canaria, it’s commonly referred to as a ‘miniature continent’. Its diverse terrain comprises long beaches and dunes of white sand contrasting with green ravines and picturesque villages, whilst a third of the island has been declared a UNESCO Biosphere Reserve. Although it’s only the third largest island, Gran Canaria makes up almost half of the population of the Canaries, which means vibrant bars, exquisite restaurants and fascinating museums are readily available. Due to its centrality in the Canaries, Gran Canaria is a great departure point for the other islands in the archipelago. You can also sail to a couple of ports on mainland Spain, so there’s no shortage of ferry options. 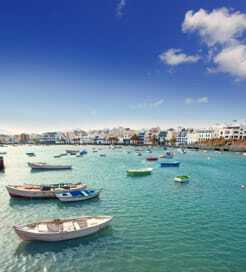 The fourth largest of the Canary Islands of Spain, Lanzarote is the northernmost and easternmost of the archipelago. Located just seventy miles from North Africa, Lanzarote has a mild climate making it the perfect destination for a holiday, any time of year. If you are travelling to Lanzarote by ferry from mainland Spain then there’s a choice of ports and ferry companies available. The Canaries are quite a long way from the Spanish mainland which results in a lengthy crossing duration and relatively high fares however the ships are generally modern with plenty to do on board, so the crossing is pleasant. Getting to Lanzarote from within the Canary Islands is relatively easy with neighbouring Fuerteventura providing the shortest and most regular option. From other islands such as Gran Canaria, La Palma and Tenerife there are a number of companies operating scheduled ferry crossings to Lanzarote.